Core, peel and slice the apple. Stew the apple in half a cup of water and sweetener in the microwave for 4 minutes. Remove the apple "stew" from the microwave. Sprinkle with cinnamon and add the crushed dark rye crackers and raisins. 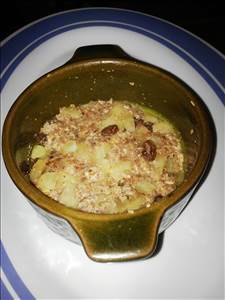 There are 245 calories in 1 serving of Dark Rye Apple Crumble.